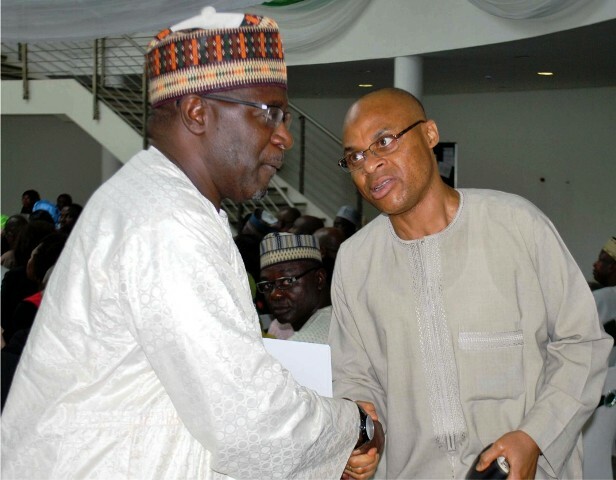 Director-General of the Electoral Institute, Prof. Abubakar Momoh (right), welcoming the Chairman of the occasion and Director-General, National Broadcasting Commission, Mr Ishaq Kawu, at the Independent National Electoral Commission's 13th Public Lecture on Media and Electoral Reportage in Nigeria,, in Abuja, recently. The Independent National Electoral Commission (INEC) says it has evolved innovations and strategies that would make 2019 general elections successful and credible. Some of the innovations according to the INEC include the introduction of simultaneous accreditation and voting system and nationwide distribution of uncollected permanent voter’s card, among others. INEC Director of Voter Education and Publicity, Mr Oluwole Uzzi-Osaze, said the commission was also working to improve on the functionality of the election card reader. He said the commission would ensure portals for voter verification, integrated voter register and e-based Permanent Voter Card (PVC) collection directional that provides useful information to the public on how to collect such PVCs. Also, the INEC chairman, Prof. Mahmood Yakubu, said a strategic plan for the elections had been made. These preparations notwithstanding, political analysts note that the 2019 elections may suffer major set-backs without prompt appointments of some resident electoral commissioners who had completed their tenure with the commission. Apart from this, a national commissioner in the commission, Mrs May Agbamuche-Mbu, said the tenure of four other resident electoral commissioners, who served in the Federal Capital Territory, Ondo, Bayelsa and Niger, would also end on May 4. Observers, therefore, note that if resident electoral commissioners are not appointed in good time, the situation will pose a serious challenge on the commission’s preparations and conduct of 2019 elections. A political analyst, Mr Solomon Adegbite, said allowing such a situation was not a good development for Nigeria electoral system. He said that it was expected that appointments should had been made earlier to fill the vacuum created by the retired resident electoral commissioners. “The new resident electoral commissioners are expected to learn from the experience of those who had spent some times with the commission in conducting elections. “If we have to wait till when all of them retire from the commission before new ones are appointed, how do we want the commission to sustain the current achievements being commended by stakeholders?’’ Adegbite queried. Sharing similar sentiments, the Chief Press Secretary to INEC chairman, Mr Rotimi Oyekanmi, said resident electoral commissioners had key roles to play in the operations of the commission. He said the commission needed the full complement of resident electoral commissioners in all the states although their absence in some states did not affect INEC operations. “We have a resume of administrative secretary in each of those states who, of course, carry on those responsibilities that resident electoral commissioner’s activities supposed to carry. “Technically, it may not affect us so much in the sense that the administrative secretaries are also capable hands and they are also experienced; but when you now bring in the full complement of the resident electoral commissioners, everything will be consolidated,’’ Oyekanmi said. He expressed the confidence that the presidency would soon do the needful in appointing credible, trusted and experienced persons as resident electoral commissioners across the country. “In December 2016, the Federal Government appointed six national commissioners. We are also expecting the appointments of resident electoral commissioners soon,’’ he said. A national commissioner, Prof. Okechukwu Ibeanu, however said the vacuum created by retirements of resident electoral commissioners would not in any way create problem of quorum in the commission’s decisions. “While the resident electoral commissioners head INEC operations at the states, they are not part of the day-to-day activities at INEC headquarters in Abuja. “It is the national commissioners who belong to the national headquarters. That is where the question of quorum comes in. So it does not in any way affect us at all,’’ Ibeanu said. “Yes, at some points something has to be done, but I don’t think it has reached a crisis point for us to get worried. “I think, at some point, pressure will mount if we don’t have the resident electoral commissioners in place, but we hope that the appropriate authority will appoint new persons in due course,’’ Ibeanu said. He also observed that it would be better if the commission had resident electoral commissioners on board in due time. “Remember that in states, we have administrative secretaries who are the bureaucrats running the state offices. “These people are still on top of the game and as soon as the resident electoral commissioners are appointed, the national commissioners and the administrative secretaries should be able to put them through,’’ Ibeanu said. Concerned citizens, however, believe that for the 2019 general elections to be successful there is need for early preparations, including the early appointments of resident electoral commissioners who will coordinate elections at the state level. This made the Nigerian Civil Society Situation Room to urge the Acting-President Yemi Osinbajo to nominate persons to fill resident electoral commissioners’ vacancies in the commission. The group called on Osinbajo to urgently send the nominations to the positions to the National Assembly for consideration. A chieftain of the group, Mr Clement Nwankwo, insisted that without urgent appointments of resident electoral commissioners’, political activities in the country would seem somewhat incomplete.